A first reading book in the Micmac language: comprising the Micmac numerals, and the names of the different kinds of beasts, birds, fishes, trees, &c. of the maritime provinces of Canada. Also, some of the Indian names of places, and many familiar words and phrases, translated literally into English. Halifax: Nova Scotia Printing Company, 1875. 16mo (17 cm, 6.5"). 108 pp. [also bound in] Bible. N.T. Matthew. Micmac. Rand. 1871. Pela Kesagunoodumumkawa tan tula uksakumamenoo westowoolkw Sasoogoole Clistawit ootenink. Megumoweesimk. Chebooktook: Megumagea Ledakun-weekugemkawa moweome, 1871. 126 pp. In 1854 Rand published his Ferst reding buk in Mikmak, which was entirely in Micmac and printed in the Pitman phonetic characters. 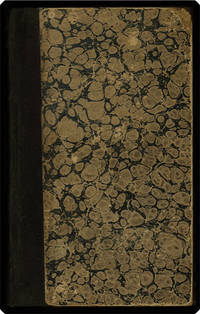 By 1875 copies were no longer to be had, so — expanding his horizons — he brought out a bilingual version in hopes of educating non-Indian children in the Micmac language as well as educating the native children in English. Provenance: Presentation copy from Rand: "To the Library of [the] Theological Institution Newton Center from the Compiler S.T.R." With the blind pressure-stamps of the Newton Theological Institution (properly deaccessioned; i.e., rare book collection sold).